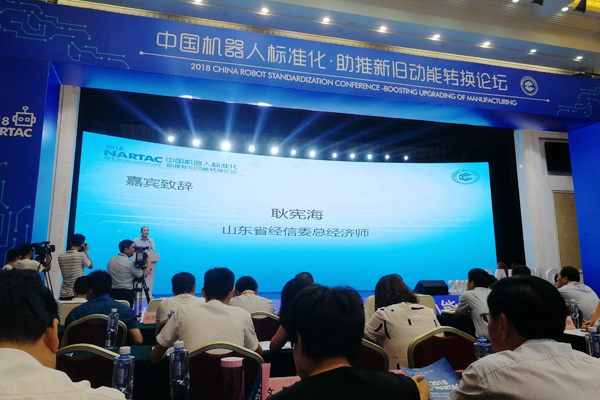 In order to support the leap-forward development of high-end equipment manufacturing industry in Shandong Province, and accurately adjust the local industrial layout adjustment and new and old kinetic energy conversion needs, on the morning of August 2, the National Robot Testing and Evaluation Center, China Robot Industry Alliance, Shandong Development and Reform Commission, The 2018 China Robot Standardization Promotion New and Old Kinetic Energy Conversion Forum hosted by the Shandong Provincial Economic and Information Technology Commission and the Jining Municipal People's Government was held at Zoucheng Selecting Mountain Villa. Tian Zhaoying, deputy director of the Industrial Standards Division of the National Standardization Administration, Qiu Lei, Director of the National Certification and Accreditation Administration, Song Xiaogang, Executive Vice President of the China Machinery Industry Federation, Qi Xianhai, Chief Economist of the Shandong Provincial Economic and Information Committee, and Vice President of the Jining Municipal People's Government Zhang Shengming and Zou City Party Deputy Secretary Wang Dunguang and other leaders attended the meeting and delivered speeches for the meeting. The meeting was chaired by Tian Chengzhu, member of the Standing Committee of Zoucheng Municipal Committee and deputy mayor. 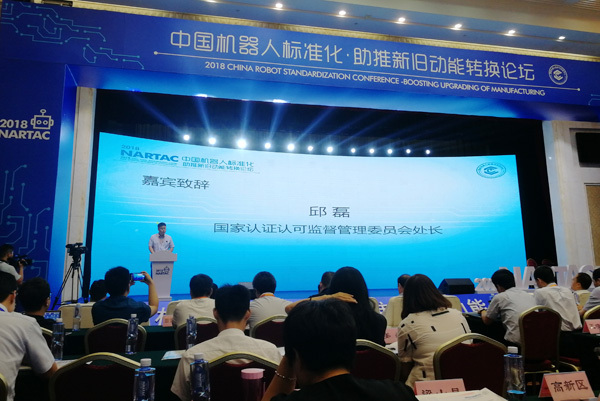 Wang Hui, manager of Shandong Carter Intelligent Robot Company, a subsidiary of China Transport, was invited to attend the conference on behalf of the group company. The meeting pointed out that the Party Central Committee and the State Council have attached great importance to the development of the robot industry, and have included robots in the key areas of national science and technology innovation in important reports and policy documents such as the government work report and the National "13th Five-Year Plan". On January 3, 2018, the State Council officially approved the "General Plan for the Construction of the New and Old Kinetic Energy Conversion Pilot Area in Shandong Province" and established the first national comprehensive experimental zone with the theme of conversion of old and new kinetic energy. Subsequently, the Shandong Provincial Party Committee and the Provincial Government will The high-end equipment manufacturing industry represented by the robot industry is listed as a pillar industry for the future development of Shandong Province. This forum was held under such a background. 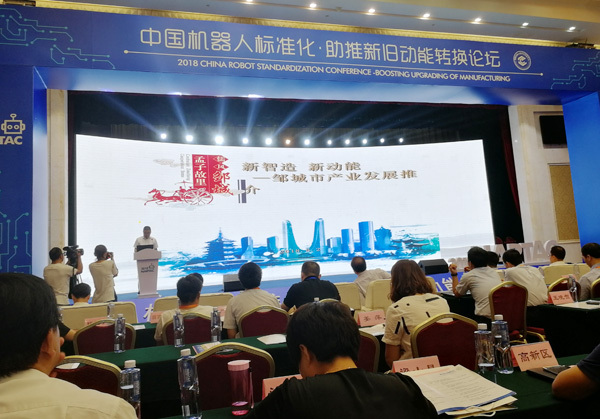 It aims to build on the strong economic base and industrial market of Shandong Province, to develop Chinese robots as an important means, and to build an industry through multi-axis interaction of “politics, industry, research and research”. The transformation platform promoted the jump from “manufacturing province” to “smart province”. 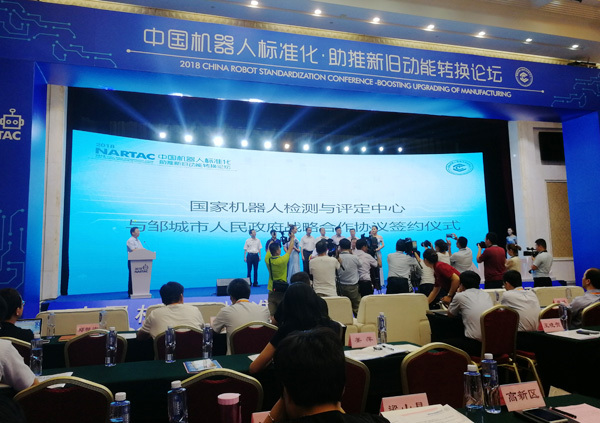 At the meeting, the National Robot Testing and Evaluation Center signed a strategic cooperation agreement with the Zoucheng People's Government. Hao Yucheng, deputy head of the National Robot Standardization Expert Advisory Group, gave a keynote speech on the development trend of robot standardization; Wang Aiguo, deputy secretary-general of the National Robot Testing and Evaluation Center, made robotic standards, testing, certification--the function setting and results introduction of the national evaluation center; Ouyang Jinsong of the Institute of Integrated Technology and Economy made a keynote speech on intelligent manufacturing thinking and suggestions. The wonderful speeches of the three experts won applause from the scene. In recent years, China Transport has actively responded to the national “China Manufacturing 2025> Action Plan”, accelerated the development of the intelligent terminal industry, and actively promoted industrial transformation and upgrading. In 2014, the Group invested in the establishment of the China Coal Intelligent Robot Industrial Park, and developed intelligent products suitable for China by introducing advanced technology concepts of foreign robots. 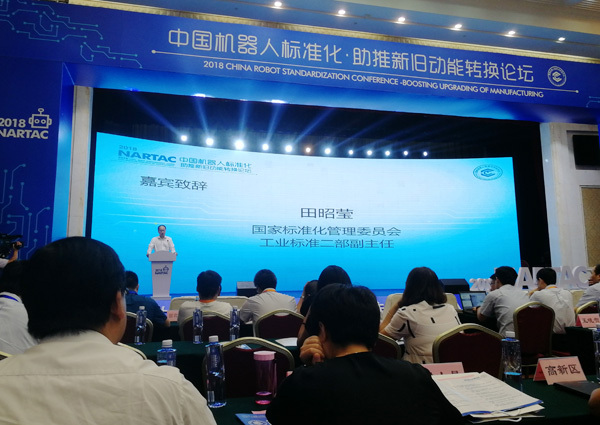 Currently, it has successfully developed industrial intelligent robots, restaurant service robots, smart home robots, entertainment robots, Fire-fighting robots, high-tech drones, 3D printing equipment, intelligent security equipment and other high-end smart products have greatly stimulated the rapid development of the smart terminal industry in southwestern Shandong and even Shandong Province! In the future, China Coal Grop will continue to play a leading role, accelerate the innovation and transformation of the Group's high-tech intelligent products, enhance the market share of the Group's high-end intelligent terminal industry, and strive to turn China Transport's intelligent robot industry park into a modern intelligent terminal industry in Shandong Province. Demonstration base, make more contributions to the new and old kinetic energy conversion in the country!